Every two years fans host a unique event for the artists who brought the Cannons, Montoyas and Bunkhouse Boys to life. It's a true reunion for the cast and crew, and a one of a kind chance for fans of the show to meet their heroes. Past guests include Henry Darrow (Manolito Montoya), Don Collier (Sam Butler), Rudy Ramos (Wind), Ted Markland (Reno), and Kent McCray and Susan McCray (producer and casting) —along with a long list of guest stars, production and crew members. The weekend is filled with one-on-one time with the stars, backstage stories, camaraderie and fun. 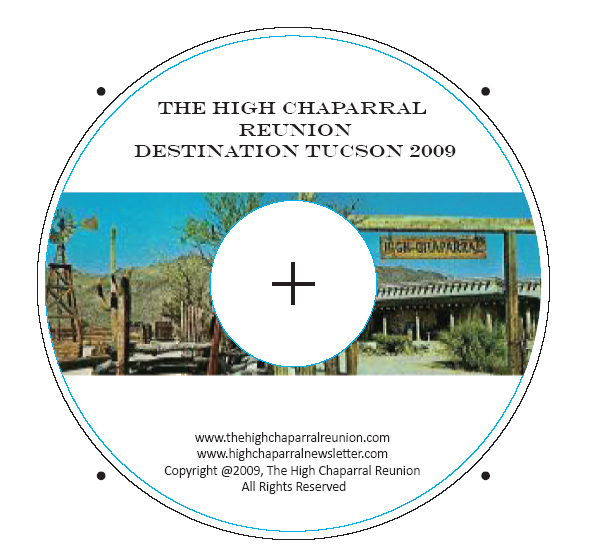 Watch upcoming editions of The High Chaparral Newsletter and The High Chaparral Reunion website for details about registration costs and all the planned events. 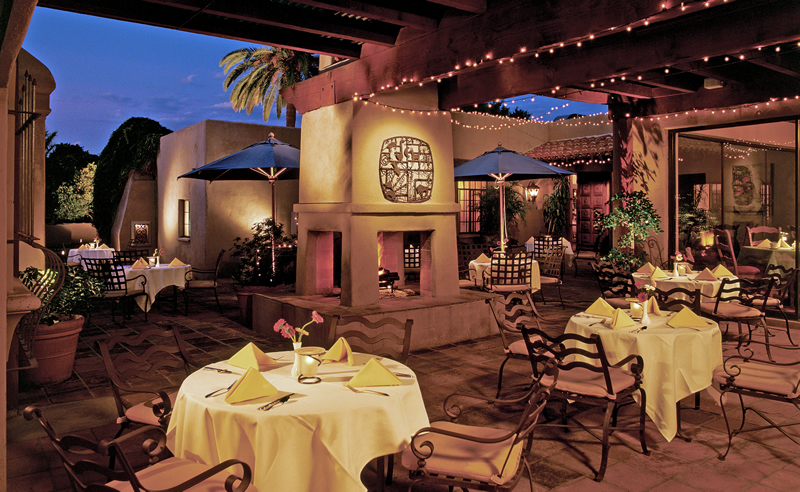 When celebrity guests and fans meet in Tucson for the 2011 High Chaparral Reunion, the official hotel will be Lodge on the Desert, a classic Tucson boutique hotel. Originally a family residence, Lodge on the Desert first opened for business in 1936. Following a $15M dollar renovation and expansion in 2008/2009, this 103-room hotel situated on five acres in mid-town Tucson will offer a special High Chaparral Reunion rate of $99 a night. (with all the required government taxes and fees the total cost will be $113.92). 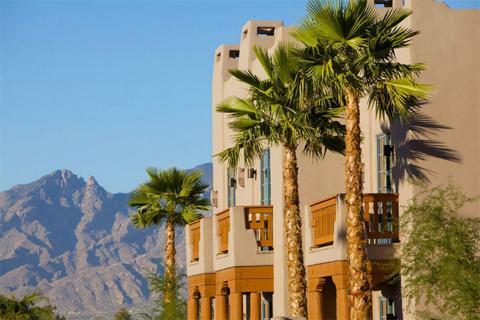 An Arizona landmark and Tucson tradition renowned for its intimate residential setting and genial hospitality, Reunion guests will discover pathways meandering among regal palms, native cacti and manicured lawns against the backdrop of the Santa Catalina Mountains. With charming rooms and spacious suites (suites are $20 more per night) Reunion fans are sure to enjoy the authentic Southwestern feeling. I’m sure just the title of this story got your attention. When you think about Linda Cristal and Cary Grant, your next thought doesn’t immediately turn to baseball! I checked in with Linda prior to the opening week of football season. And because my football team would be playing their arch rivals on Sunday Night football, I was very excited about it, and our discussion turned to sports. Linda is a big fan of soccer and basketball. She hates baseball – “because it is boring, too slow!” However, she has been to several baseball games. Why would she go to a baseball game when she doesn’t like baseball? That’s when she told me the most wonderful story about Cary Grant and baseball. For her fans in Argentina and South America, she graciously included a Spanish translation. Also for her fans in Argentina, Linda tells me she saw a member of the press from Buenos Aires last month in Beverly Hills. They were quite taken with her. They told her she looked incredibly young and beautiful with skin like a china doll! Cary Grant. El hombre mas buen mozo y mas carismatico del mundo! Estabamos los dos trabajando en los estudios de la Universal. Yo, como una principiante recien "importada" de Mexico. El como toda su vida como un superstar. El departamento de publicidad del estudio decidio usar su figura publica alrededor del mundo para avanzar el lanzamiento de su nueva estrella. Resultado: una sesion de fotos en el "back lot" con Cary abrazandome, mirandome a los ojos como solo Cary Grant puede hacerlo. Nuestros labios casy rozandose. Inolvidable! Al dia siguiente me envio una nota a mi camerino para invitarme a ver un partido de baseball. "Baseball?" me pregunte. Ja ja... Odio el baseball estan aburrido, tan lento! Pero quien en su sana razon le dice "no" a Cary Grant? El hombre es un mago del romance. Ademas, cuando yo lo miraba durante el partido lo veia en mi imaginacion en cada una de sus peliculas enamorando a Grace Kelly, Ingrid Bergman, solo que yo tomaba el lugar de cada una de ellas. Hasta que un dia Gracias a Dios tuvo que irse a locaciones y se acabaron los partidos. Pero empezaron las cartas los llamados por telefono... Y quien le dice que no A Cary Grant! “Cary Grant—the most handsome and charismatic man in the world! We were both working at Universal Studios. I was new in town, recently “imported” from Mexico, and he was a superstar!" The studio publicity department decided to use his public figure around the world to advance the launch of their new star. As a result, there was a photo shoot on the back lot with Cary embracing me, looking into my eyes as only Cary Grant can – our lips almost brushing easily. Unforgettable!" It sounds like it ended there. Cary went his way; Linda went her way. Until Linda’s daughter-in-law found this cool video from the Hollywood Foreign Film Awards. Her date at the award show was none other than guess who—Cary Grant! Linda at Hollywood Foreign Film Awards, from www.criticalpast.com archives. Linda said, “One of my dear fans in Argentina sent me a letter with a dynamite question! The answer is in a Pandora’s Box… I think. She asked why the relationship with Cary Grant did not go on after he searched for me everywhere under the sun. She couldn’t understand how I could resist his cooing. I was travelling with one of my films doing 28 cities in one month and had left after his ‘introduction to baseball.’ I didn’t find the answer in Pandora’s elements. I didn’t have to open the box. I knew why." Linda feels very blessed with choice she made. While Linda and husband, Yale Wexler, were only married for 6 years, they remained very close friends. What would it have taken for Linda to choose Cary Grant? “If I had chosen Cary he would have had to sign an iron tight prenup to extradite baseball out of his life forever!! !” Looks like Cary would have had to switch to soccer or basketball! David Dortort, creator and producer of The High Chaparral and Bonanza, died on September 5, 2010 at the age of 93. Dortort died in his sleep at his home in Los Angeles after a long bout of cardiac illness. He is survived by a daughter, Wendy Czarnecki, of Petaluma, Calif.; a son, Fred, of Berkeley, Calif.; a brother; and a granddaughter. 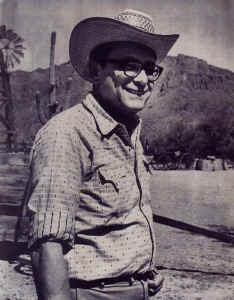 Well known for Bonanza, Dortort influenced how people viewed not only the American West but how they viewed television. Bonanza was the first prime time western to air in color, and when it opened on NBC in 1959 its lush scenery, set in the wilds of beautiful Lake Tahoe, energized the new TV technology. NBC, with Bonanza, partnered with television manufacturer RCA, and together the phrase ‘now in living color’ at the Ponderosa Ranch pushed color sets into the living rooms of America. Soon the Ponderosa family, starring Lorne Greene as father Ben Cartwright with Michael Landon, Dan Blocker and Pernell Roberts as his sons, was televisions highest rated show. For 14 seasons The Cartwrights rode into living rooms, and after the last broadcast in 1973 the show continues on in syndication. Not content with the family dynamic of Bonanza, Dortort searched for a historically authentic western that would allow for social commentary on current issues of the day. When he created The High Chaparral, he struck gritty gold, winning acclaim for its culturally accurate cast and realistic depiction of whites, American Indians and Mexicans during 1870’s Arizona. 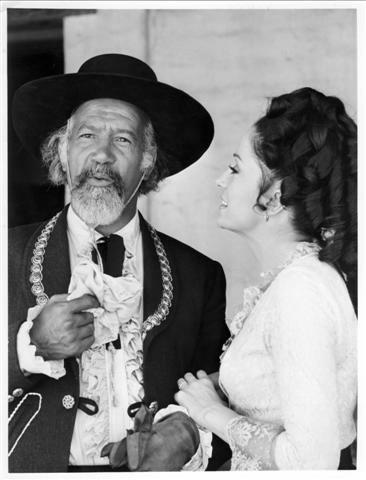 In interviews about The High Chaparral, Dortort said, "We're trying to make restitution to what I feel are damaged reputations. High Chaparral is based on the truth. We have a commitment to authenticity." 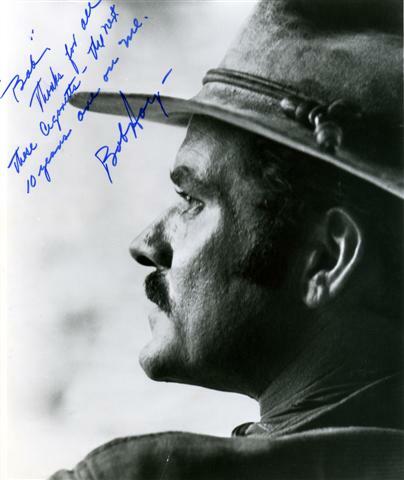 The members of The High Chaparral fan community extend their heartfelt condolences and prayers to the Dortort family at the sad news of his passing. Like the first breath of springtime, Nightfall by Susan McCray speaks to life’s sweetest possibilities. 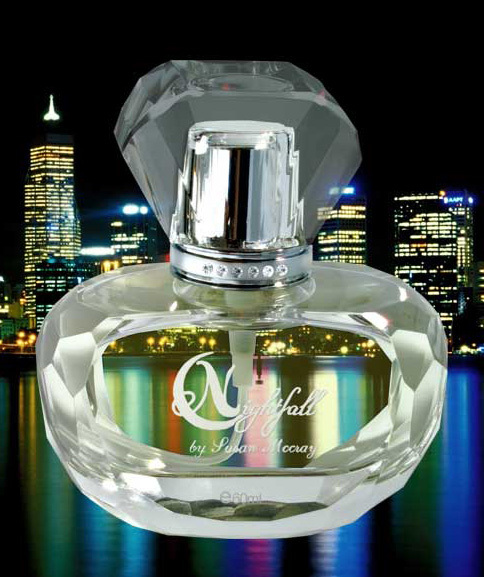 Made from the highest quality, all natural ingredients, Nightfall by Susan McCray is the alluring new fragrance that captivates the senses. Reminiscent of the musical composition for which it is named, Nightfall by Susan McCray is a delightful melody of white florals, accompanied by notes of fresh citrus. Its French crystal bottle capped by a Rhinestone-trimmed cap evokes the elegance and style of the fragrance within. Packaged in a customized perfume box with patterns of nature that address its purity, the scent is simple but classically elegant, fresh yet complex. Nightfall by Susan McCray enhances a woman’s individual style, her very presence and sophistication. 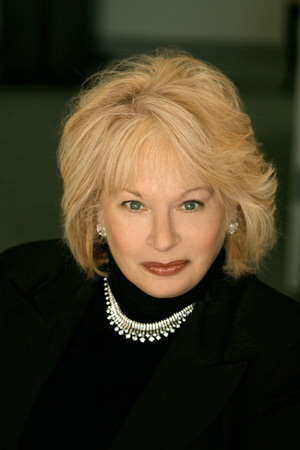 Susan McCray was just 8 years old when she began experimenting with perfumes. Her mother, Francesca from whom Susan inherited her keen sense of style and appreciation of scents, would smile about how her daughter would one day launch a fragrance line.That however, would have to come later … since her daughter’s successful Hollywood career, for which she was very proud, would come first. 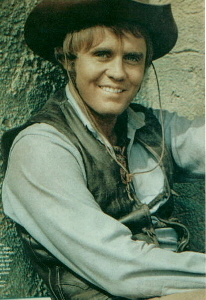 Susan worked closely with Michael Landon, serving as the casting director on his shows, including Little House on the Prairie, and Highway to Heaven, as well as other audience favorites: Hawaii 5-0, The High Chaparral, Father Murphy and numerous movies for television including The Diary of Anne Frank. McCray is now getting back to a childhood dream: Producing a fabulous fragrance line. And that she has done, with Nightfall by Susan McCray. Visit Nightfall and Susan on Facebook! Another great newsletter, Penny! I really enjoyed Wendy's and Tina's articles -- and since I have one of Linda's CDs, can vouch for her lovely voice. One correction: Our own TANJA did the translation of the BRAVO article, not I. TANJA was kind enough to translate quite a few BRAVO articles from the original German to English for me, which I really appreciate. High Chaparral was a huge success in Germany and BRAVO, a movie/tv mag, did many articles on the good-looking stars, especially Henry, who was frequently on the cover. Without Tanja, I'd have no idea what the articles said! It was August 1974 and I had turned eighteen in June. I had to have an eye operation, and the doctors and my parents refused to let me wait any longer (I was still on Dad's insurance). I was totally disheartened because I'd heard that Mark Slade and Linda Cristal were to be at the rodeo in my hometown (Eugene, OR) - and I wasn't going to get to see them! The adult floors in the hospital were full, so they put me in the children's ward. We all thought that was funny; I didn't mind because I hadn't quite "grown up" yet anyway. After the operation, I laid there, miserable and drugged up and I had a patch over one eye. But, I refused to feel sorry for myself; the little girl next to me had both eyes patched closed. 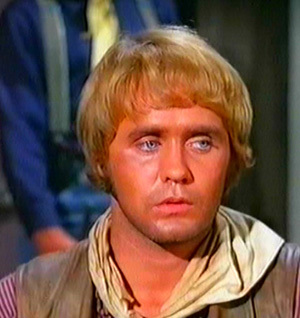 In walks Mark Slade, in total Blue get-up (sans gun, of course)! No one told me he was coming to the kid's ward. Of course, I was thrilled! He held my hand and stroked my arm, while he and I talked a little (I think I babbled), and he talked to my parents a bit. His eyes and smile enthralled me. And he didn't treat me like a ditz, even though I was completely star-struck (hence the babbling). I had a pen and pad of paper on the nightstand. He used the pen to autograph the back of a photo of the entire crew. Then, without thinking that it might be an imposition, I asked if he could sign one for the little girl in the next bed. He smiled and nodded and walked over there and signed one for her. And then he brought back my pen. He held my hand just a little longer while the drugs overtook me and I fell asleep, perfectly content to be holding hands with Mark Slade on the children's ward! Thing is, I don't know to this day if I ever thanked him for signing a photo for that other girl. If not, then I say it now: Thank you, Mark! 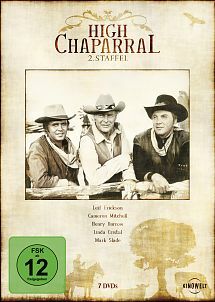 A 7 DVD set of The High Chaparral in German and English is available from Kinowelt, a leading film distributor and DVD provider in Germany has announced they will release Season 2 of The High Chaparral on December 9. The announcement is on the Kinowelt site here. The Season 2 DVD is available on Amazon Germany for pre-release sale now. The Kinowelt DVDs are in PAL (European) format with both German and English languages and Dolby sound. In the U.S an all region/all format DVD player is required to read the PAL formatted discs, however most newer model players are all region. Check the manufacturer/model documentation to be certain. Computer DVD players will typically always play back a PAL formatted disk so the episodes can be watched that way if the TV DVD player won't accept the PAL format. The first season set includes the two hour pilot. Episodes on the Kinowelt set have crystal clear, crisp sound and picture quality. Regular season episodes appear to be complete and uncut and of exceptionally high resolution. The set is listed on Amazon Germany for $39.95 EU. Fan Nan Hatch sent this poem for all of us - including the Bunkhouse Boys. Alas, we're all getting a bit older and have to give up a few things. I have reached old fogeyhood, I fear! Or the pump gets all excited, and it may not pump no more. Though truth be told, I did enjoy those indiscretion sessions! They say my thinking will be clear, but is this only charity? At my age, what am I to do with all this ‘thoughtful clarity’? In watching lovely sunsets with non-alcoholic beer. And hope with all this sacrifice, my ticker beats more strongly! Dwayne Sharp contacted us to generously share some of his family photos collected from his grandfather, Bob Sharp. 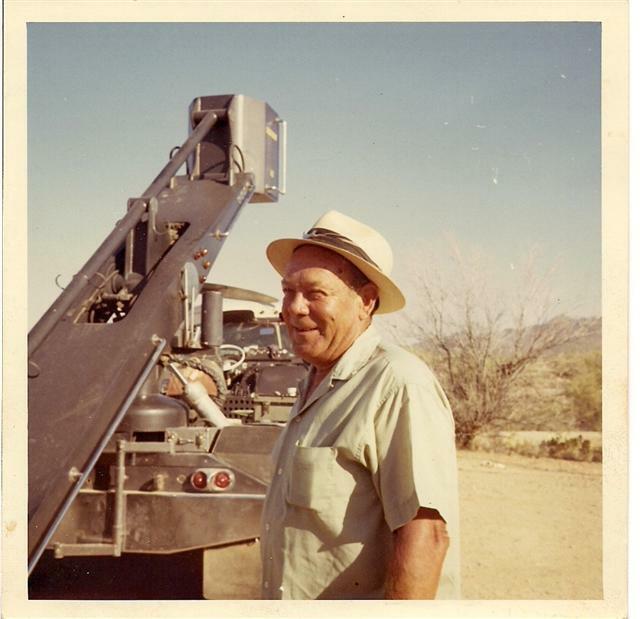 Bob worked on the Tucson set. High Chaparral was the last show he worked on before passing away with cancer, and Dwayne shared a family story. "Grandpa Sharp was always about work, and all the sets he worked on. 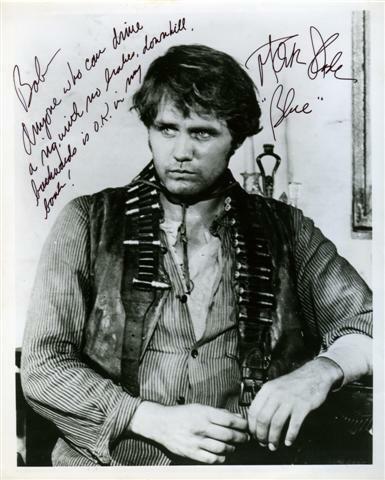 On a shoot on High Chaparral, the Boom Truck, or some type of Rig, lost its brakes, and my Grandfather, Bob Sharp was at the wheel, and drove it down a hill, backwards, with out BRAKES to safety. I hope this helps out on who my Grandpa was on the HC. set. We, the Sharp family are very happy to remember HC , the actors, and the crew will remember my grandpa." Look closely at the signed photo by Mark Slade, and you'll see a reference to this story about driving a truck backwards, down a hill with no brakes. Thank you to the Sharp family for generously sharing their grandfather's photos. "I hope you are well and that everything is going good for you. Thank you for the recent HC newsletter. I always look forward to receiving it!!!!! 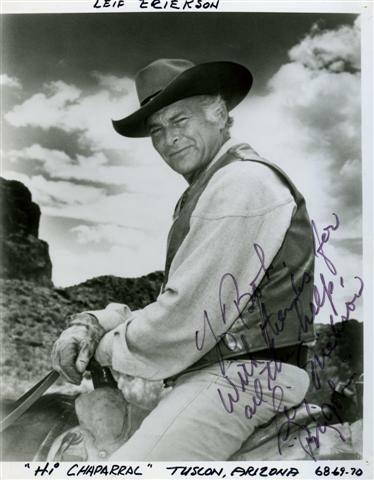 I just wanted to send you a vintage photo that I have in my TV western album from famous TV westerns. What is so special about this photo is that it is the one that local TV stations across the country received for their advertising of their respective affiliate stations (ABC, NBC, and CBS.) Wow, this is way before ALL the TV stations and channels we have today!!! I believe that it could have been used in TV Guide also, as well as the other local TV magazines that were produced all across the country. 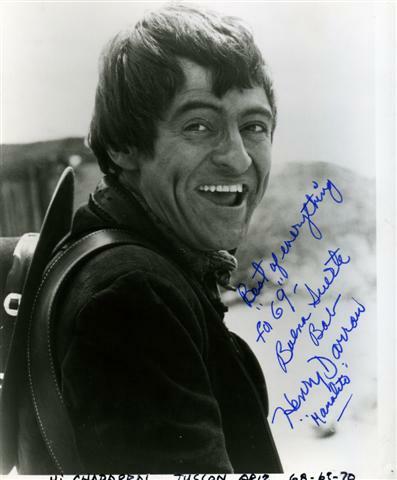 One of my favorite happens to be from "The High Chaparral!" 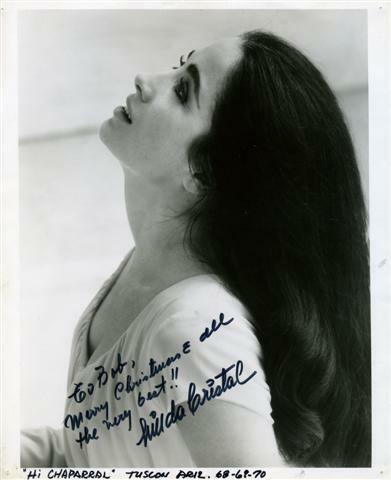 It is of both Frank Silvera and Linda Cristal as their respective characters, Don Sebastian and Victoria. I love this photo and it is my favorite of Frank and Linda. There is so much affection between them and it makes me miss Mr. Silvera even more to this day! " Thank you Woody, for generoulsy sharing from your private collection with everyone! Of course running footage of a coiled snake is a smart move. It’s much safer to cut to a pre-filmed animal than to put cast, crew or stock at risk by facing a live one whenever it was required. There were enough dangers that a snake might make an appearance during filming than to go around introducing more. According to Kent McCray, among the many animal wranglers who worked on the show, there included a rattlesnake wrangler! His job was to go out into the brush behind and around the Chaparral buildings where he would kill any rattlesnakes he encountered – every day before shooting could begin! Now there’s a job that deserved danger pay! So what do we actually know about this beautiful but dangerous marvel of evolution? There are about 30 species of rattlesnake (excluding subspecies) and every one of them lives in the Northern Hemisphere. Given that nearly all of the world’s most venomous snake species are found in Australia, those of us in the Southern Hemisphere are quite happy to let the rattlers stay up there. The largest species is the Eastern Diamondback. It generally doesn’t grow much longer than 8 feet in the wild, often less. The Western Diamondback is common to Arizona and the one we see in High Chaparral. It is the largest of Arizona’s snakes and responsible for the greatest number of bites each year. There are more species of rattler (about 11) found in the Sonoran Desert than anywhere else. Rattlesnakes belong to the Pit Viper family. There are two groups of vipers; Old World Vipers (Viperidae) and New World Vipers (Crotalus). The name pit viper comes from a ‘pit’ that is a bit below the nostrils. It is actually a sunken scale. Old World Vipers, (commonly called pitless vipers, true vipers or true adders) also have the sunken scale but lack the heat sensing ‘pit’ of the New World Vipers. This heat sensing pit lets them hunt in total darkness. Rattlesnakes are New World Vipers therefore possess the heat detecting pit. With it, the snake can sense temperature differences in their surroundings down to a fraction of a degree. When they detect an increase in temperature, called a temperature ‘image’, it tells them that warm blooded prey is nearby. If the temperature image is too great the snake is warned that it may be in danger of becoming prey to a larger animal. The size of the image is a good indicator of the size of the animal emitting it. Approximately 8,000 people are bitten by snakes in the US every year. About 75% of bites are attributed to rattlesnakes. Of those bitten by rattlesnakes, 72% are males. That should our give male readers something to think about. Could it be because males put themselves in positions where they are more likely to encounter a rattlesnake than females or are they less cautious than the ladies? Although the rattle is used as a warning device, not all rattlesnakes bother to sound this warning before attacking so care must always be taken if you see one. Even tightly coiled, a snake can strike about 2/3 of its body length. It’s understood that if you can see the rattle clearly, you are far too close. The rattle is made of keratin. This is the same substance as our hair and nails. Baby snakes are born with a pre-button where the rattle will grow. The pre-button is lost with the first shed. After that, the first segment, or button, of the rattle will form. It is worth noting that the venom of baby rattlers is more concentrated than adult venom and that babies are far more aggressive. So don’t be fooled into thinking a juvenile poses less of a threat to you. The rattle is empty. Each saucer shaped button sits nested in the next one, forming a rattling sound when shaken. The buttons are modified skin cells from the tail. Many people believe that you can tell the age of a snake by the number of buttons on the rattle. This is not so. Snakes often shed more than once a year and the brittle keratin buttons can break and fall off. Have you ever wondered why you only see a rattlesnake’s long fangs when it strikes? Where are they the rest of the time, you might ask. The hollow fangs are connected to muscles that allow them to fold back when not in use. They lie parallel to the jaw line. Opening the mouth causes an instant muscle reaction that flips them forward. The fact that ‘dry strikes’ (strikes that do not release venom) occur suggests that the animal has control over the venom glands. These glands are at the base of the fang and when venom is released, it travels through the hollow fang with a syringe effect. Rattlesnakes can eat animals that weigh more than themselves. Their diet tends to be small mammals such as rats, mice, gophers and chipmunks. They also eat birds and amphibians. Hunting tends to occur at night since much of their prey is nocturnal. They too are hunted, often by owls, hawks, eagles and other snakes. When John accidentally steps on a rattlesnake in The Brothers Cannon episode, everyone’s fear for him is justified. Without anti venoms, or indeed nearby hospitals, the risk of John’s death was great. Rattlesnake venom is scary stuff. It is a potent blend of toxins that affect blood, enzymes – which break down and digest cells – and assorted other substances that cause muscles such as the heart and lungs to seize up or lose control and others that cause the blood pressure to drop. All rattlesnake bites should be taken seriously and attended to by a doctor as soon as possible. While many people survive the bites, numerous are left with lasting tissue damage, scarring and/or permanent disability. Even handling dead snakes can be dangerous since the fangs can release venom. 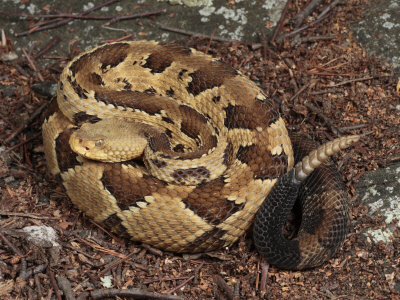 However, like all misunderstood predators, the rattlesnake plays an important role in nature. They provide a vital service. Without them, populations of vermin, like rats and mice would increase. With that, more spread of disease. Their prey eats valuable crops as well. 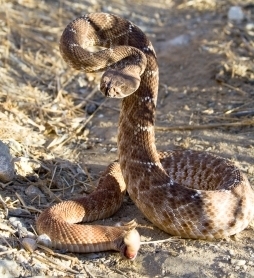 Unless threatened, most rattlesnakes avoid humans. Many bite victims approached too close for the animal’s comfort so if you see one, give it plenty of room to escape. Many bites result from accidentally stepping on a snake so take care watching where you walk in snake territory. It is an easy enough mistake to make. Like John did, I once stepped on a large venomous brown snake, failing to see it basking on the sandy ground where I walked. It was easily over six feet long and I walked right over it. Snakes can be right under your nose and you can miss them. Fortunately for me, it was a dry strike so I lived to write this article where I hope I have helped you to better understand this beautiful creature. *For any Leonards out there, please note that this is not intended as an insult. I think rattlesnakes are amazing and beautiful creatures so it is more in the line of a compliment. Did You Know? A rattlesnake can shake its rattle up to 60 times per second! 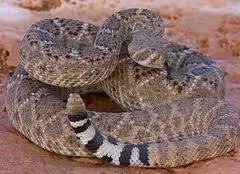 Although rattlesnakes were and still are a danger to people, they also provided a meal to many an Old Wester. Lots of the snakes were simply skinned and fried while more adventuresome chefs tended to prefer them in a chili. Since the people of the Old West often ate these snakes, we thought it might be fun to include a recipe. Thanks to our own Rusty LaGrange, we have some information about cooking rattlesnake to share with you. However, be warned! This recipe is included more as a curiosity than as something for you to try. Handling and preparing rattlesnake poses very real dangers. The dead snakes can continue to writhe and/or bite for as much as several hours after they are killed. The head, once removed, can also still bite. This is caused by reflex actions in the muscles. The snake is not consciously attacking but that doesn’t make the bite any less dangerous. According to Rusty, any seasoning will do though she prefers Cajun spice. My research also suggested that hot spices are popular with this meat. •	Don’t overcook it and make it too tough to eat. •	Rinse the snake meat and cut it into 4 inch lengths, simmer it in butter and lemon to soften the meat. Simmering in milk doesn’t seem to matter. Butter tastes better. Like sautéing fish. •	Dredge the pieces in flour, egg and light mix of spices. •	Mix with Cajun spice, parsley and a bit of garlic powder. Toss the pieces back into the frying pan on medium heat. You have to watch it closely so you don’t crisp it too much. There’s so little meat on the body that it gets stringy. •	Remember that it’s full of spiky little spine bones all the way through, so you’ll have to pull the meat away from the bones with a fork. Cut snake meat into 4-inch lengths. Beat egg and milk. Mix spices, except Cajun spice, with flour in a separate bowl. Preheat cast iron pan with cooking oil. Dip snake into egg mixture and then in flour/ spices mixture, then sprinkle lightly with Cajun spice and place it in medium hot oil. Cook until the white-ish meat changes color to a gray-brown and begins to crisp on the edges. Place fried snake pieces on a paper towel to drain. The snake will cool down quickly so eat as soon as you talk yourself into it!